The home of quality snack products for the Licensed Trade. We supply a range of Traditional Hand Cooked Pork Snacks to suit differing tastes. We also supply a range of the Finest Quality Nuts served on platters for the Top End of the Licensed Trade. Our very latest product is Senor Alberto Snacking Olives packed in ambient pouches. Uncle Alberts Scratchings are a traditional hand cooked scratching packed in clear bags and are a firm favourite in the Pub Trade, where customers like to see the scratchings they are buying. Senor Alberto Snacking Olives are a tasty alternative snack in an ambient pack perfect to consume at anytime and full of natural Mediterranian Flavour. Uncle Alberts Barnsley Pig Pork Crackling is a traditional hand cooked crackling packed in a foil bag more popular with retailers and Cash and Carries who need the longer shelf life that foil packing delivers. 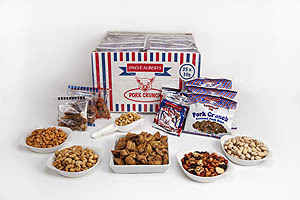 Uncle Alberts Pork Crunch is a pork rind which has been flash cooked to blow up like popcorn then seasoned to create a pork snack with an easy bite sensation. Uncle Alberts Nuts Range are a range of top quality nuts for the discerning end of the Pub Trade to serve on platters for their more sophisticated customers. If you are a Pub or other retailer without a local wholesaler stocking our products, then you can order online at wholesale prices. (Go to Buy Online) or order from our main Snack Brands website.